7 Steps To Safe Workouts! No one plans on getting injured when they go to workout. Check out these 7 steps for a safer workout and more fun in the gym. Nobody goes into the gym planning to get injured. Still, most people tend to do just that at least once in their journey to a fit physique. Some things can&apos;t be helped - bad luck strikes in the gym easily as outside it - but there are some steps you can take to tilt the odds in your favor. This may sound like the king of cliches, but guess what? A large percentage of the gymrats out there, especially the younger ones, are so eager to hit the bench press that they skimp on or ignore the warm-up altogether. This is a big mistake. Properly warming up will raise your core temperature, get your metabolism into gear and "pre-lubricate" the joints in preparation for the actual workout. Simply put, your body is ready to tackle the big weights. 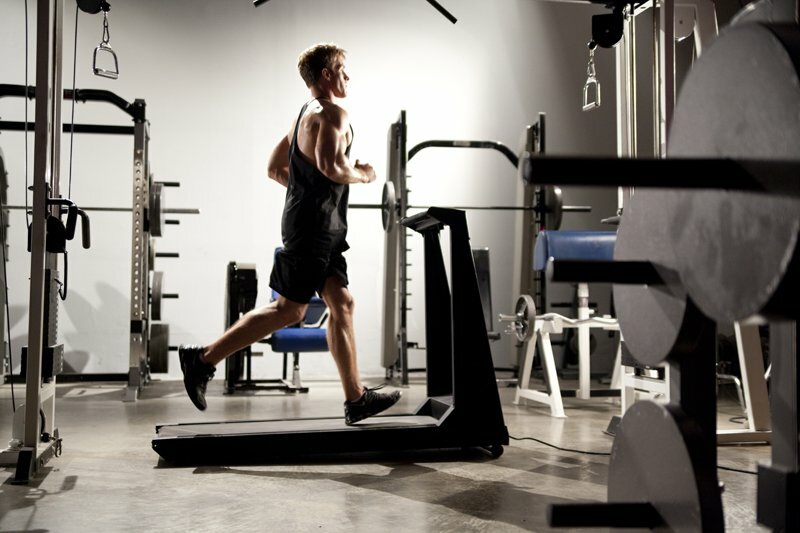 Your warm-up should consist of 5-10 mins of moderate cardio on a treadmill or stationary bike, 5 minutes of light stretching and, as you get ready for the weights, 1-2 light sets before your "real" sets begin. Failure to stretch will make your muscle bellies shorten over time, making you less flexible. While it may seem like a minor aesthetic detail to get that slightly-hunched, gorilla-look, your muscles and joints become a lot more vulnerable. Why? If a supporting muscle stiffens or becomes shortened, it will start interfering with the normal groove of your exercises. Not a big deal at first, but over time you train increasingly "wrong" and put a lot of extra stress on joints, ligaments and unintended secondary muscle groups. The cumulative effect over a couple of years can throw some serious curveballs at your bodybuilding efforts. In addition, stretching between sets flushes out lactic acid and byproducts while bringing in fresh nutrients, thus making your stronger for your next set. Finally, the post-stretching helps you recover faster between workouts. Proper stretching is not rocket science. Click here to read more about stretching, but in a nutshell; you stretch slowly, without bouncing, for 30 seconds or more taking care not to inadvertently put undue stress on the joints. It can be tempting to load up the big weights and cheat your way through the set. And sure enough, controlled cheating is a tried-and-true intensity boosting technique advocated by Arnold and many other prominent bodybuilders. The key word, however, is controlled. Cheating should only be done at the end of a normal set to squeeze out a few "bonus" reps. If you have to sway or use momentum from the second rep on, you&apos;re using too much weight. Another aspect of control is avoiding any type of bouncing, jerking or partial moves forced by necessity. In other words, if you stop halfway down in the negative phase of your biceps curls because you wouldn&apos;t be able to curl up otherwise, you&apos;re using too much weight. And let&apos;s not even talk about the "bench press perverts" who still, after years of articles and books recommending against it, just love to thrust their pelvis up as far off the bench as they can when doing presses so that the only point of contact anywhere is their feet and their shoulders. I&apos;ll put it really simple: don&apos;t. Keep your back flat against the bench and use your muscles to lift the weight as it was intended. Lastly, hoisting barbells and dumbbells above your head by bending your knees should only be done by experienced lifters (wearing a belt) as part of a comprehensive strategy. A newbie squirming around all over the place trying to get a heavy barbell over his head is as close to asking for it as you&apos;ll get without actually saying the words. This brings us to the next point: your midsection is the stabilizer that holds you together. Fail to build a solid, balanced midsection and you&apos;re in the danger zone, especially from any type of overhead press. Why is this? Think about a barbell military press. From feet to hips, you&apos;re pretty much standing straight. Then you lean backwards so that you can stay balanced while pushing up the barbell and the only thing protecting your spine is your abs. In fact, ab tension is a prerequisite for getting into the starting position. That&apos;s the obvious example. Less obvious, but perhaps even more crucial, is the role of your midsection when you do rows, pushdowns and various leg exercises. In these examples, your abs is merely a secondary thing that doesn&apos;t automatically require tensed abs - you need to do this consciously. If you don&apos;t, you risk putting undue stress on your spine. The big Kahuna of ab power is rectus abdominis, the "six pack" (actually a single muscle) that runs from your rib cage to your pelvis. However, it is prudent to include a couple of exercises for obliques as well. Which Do You Use More: Dumbbells Or Barbells? I Keep A Good Balance. There are two sides to this coin; balance as it refers to how you stand and sit as you lift weights, and balance in terms of muscle strength equalization. The former is pretty straight-forward. When you stand and do curls, pushdowns, presses or whatnot, don&apos;t do so with locked knees. Stand as you would stand on a bus in motion, tense up your abs and you&apos;re in good shape. When you lie on a bench, put your feet up on the bench too. This will force you to stay balanced through presses or skull crushers; otherwise you&apos;d simply fall off. As you get into the hack squat, relax your shoulders, straighten up your back and slide up to the pads by straightening out your knees (not "duck in"). You get the idea. The other side of the coin is equally important. Most people are a tad stronger in one side, i.e. you can do two more reps with your left arm than your right. This isn&apos;t a big problem in day-to-day life, but when you enter the gym things get a bit more complicated. If you tend to go with exercises that allow the stronger side to overpower and take over some of the load from the weak side, you&apos;re in trouble. Typically, most barbell exercises and machines with a single bar are guilty of this. On the other hand, dumbbells and machines where the two handles operate independently make this impossible. Having said that, I&apos;m not advocating you ditch all barbells from your workouts. That&apos;d be stupid, as you&apos;d miss out on some of the most effective exercises there is (deadlifts and squats, to name a few). However, it is prudent to mix the two types in every workout and, if uneven strength is already a problem, consciously holding the stronger side back until they have equalized. You don&apos;t buckle up in your car because you expect to crash - you do it because it&apos;s a quick and easy insurance policy for the slim chance some numbskull slams into you. However, if it does happen, you&apos;re very, very happy that you took the two seconds to do it. The gym works the same way. When you do calf presses in the leg press machine, odds are very low your feet will actually slip off the edge. However, if they do, and you don&apos;t have the stops engaged, you can kiss you shins and knees goodbye. Likewise, attempting heavy barbell bench presses to failure without a spotter is little more than Russian roulette. You can even up the ante by using "monkey grip" (thumbs on the same side as the rest of the fingers) for the added thrill of potentially dropping 300 lbs on your face. None of this is rocket-science, and chances are good most of your precautions will be completely pointless. However, the one time you DO mess up, you will be very happy you took the extra few seconds to play it safe. Not all injuries are of the flash-bang nature. In fact, a good chunk of the stuff that ails people is cumulative problems built up over months or even years. If you do bicep curls a little bit wrong so that you put undue stress on a joint, it obviously won&apos;t send you to the ER right away. However, it will be a bit sore - and when you hit it again a few days later, it hasn&apos;t had time to heal properly, thus pushing it another inch towards the brink. Repeat a few hundred times without ever giving that joint a chance to recover, and you&apos;re all set for disaster. By listening to your body and taking extra rest days you can avoid a lot of problems. So your elbow feels funny from last week&apos;s skull crushers? Then let it rest - hit the treadmill instead. Knee aching? Perhaps this is not the time to attempt a new squatting record, even though you planned it for this day. Dedicated bodybuilders often take pride in sticking to the program. Hitting the gym on schedule week after week is one of the most important factors of long-term success there are, but there&apos;s an exception to the rule: if you&apos;re on the edge of overtraining, it is actually MORE beneficial to take time off than going to the gym. Also, getting a solid 8 hours of sleep per night is important. Not only do your joints, muscles and nervous system recover faster, you also benefit from the natural burst of hormones that will help you grow. Last but not least, if you&apos;ve been skimping on sleep you lose mental focus. You know that driving at 2 AM after a long day dulls your senses and makes your reactions slower. Being unfocused in the gym equals sloppy lifting, unintentional cheating and potential injury. Keeping these 7 steps in mind won&apos;t guarantee an injury-free life, but the odds and the severity of any incident should be drastically reduced. It&apos;s mostly common-sense stuff anyway; you just have to get in the habit of doing it. Good luck!